Participate in the Race Program! Learn to race and become competitive with our Race Clinics. Practice skills in Spring, Summer and Mid-Winter Racing. Be part of a supportive, fun and friendly club. Meet others and stay active on the water! everything from the basics to advanced sailing skills. Sail with us on SF Bay! world's top sailing destinations -- San Francisco Bay! Join our next Destination Sail! We offer sailing vacation and custom trips. Looking to learn? Come give us a try on an Introductory Sail. Learn more! Start sailing now! Beginners will feel confident learning skills by taking beginning American Sailing Association courses. Advanced certification is available for more experienced sailors. Relax, explore, and have fun. Modern Sailing curates and hosts unique sailing vacations to exotic and interesting destinations: internationally and along the California Coast. 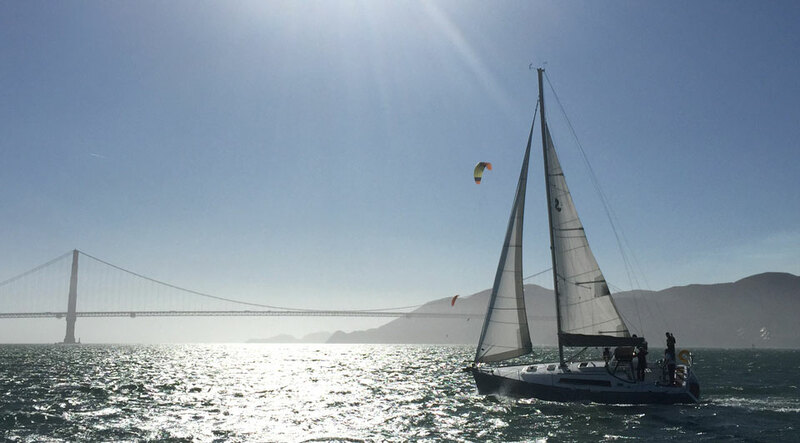 Spend the day sailing on the beautiful San Francisco Bay. Hire our experienced skippers to give you a tour. Or, let us help you plan the ultimate team building activity - a Corporate Challenge Race! Modern Sailing School & Club has been introducing people to sailing from our headquarters in Sausalito, California since 1983. Even if you have never set foot on a boat, we can teach you everything you need to know to build a strong foundation in this rewarding and life long sport. MSC is dedicated to making your learning experience as safe and enjoyable as possible. All of our beginning courses are taught on 30 - 32 foot keelboats with wheel steering (no tillers), inboard diesel engines, and roller furling jibs. These features will help build confidence right away. Our experienced and friendly instructors hold US Coast Guard Licenses and represent decades of sailing experience. They are award winning instructors, world cruisers, and Coast Guard Commanders. Our high standards have earned us accolades in the sailing community, including the American Sailing Association's School of the Year Award.